Oracle Database storage is frequently used as the back end for business-critical applications in the enterprise. Therefore, staying on top of user activity is a must-have to ensure the security of your structured data and the ongoing availability of your critical assets. By enabling native Oracle Database monitoring, you can stay abreast of database performance and get a regular analysis of system changes. However, if someone deleted a table in one of your instances or modified a role to escalate their privileges without good reason, are you confident these native performance monitoring tools would catch it in time for you to mitigate the damage? To make sure things are running smoothly, you can assess the performance impact of any action by enabling Oracle performance monitoring. The built-in SQL Performance Analyzer, which requires scripting queries in SQL, facilitates Oracle DB monitoring by comparing the performance of the SQL statements in a tuning set before and after a database change, such as an operating system or hardware upgrade, a schema change or the creation of SQL profiles. After gathering these performance metrics, the tool delivers a report that you can view in order to get an idea of what changes in execution plans or performance of SQL statements occurred. However, with only this performance monitoring, you can’t be confident your assets are safe and security gaps are covered, because you won’t be able to know what’s going on in your Oracle Database environment. For example, you can’t see who modified an audit policy, who made multiple failed attempts to connect to the database, or who removed tables. But wouldn’t you want to know about such critical events as well? 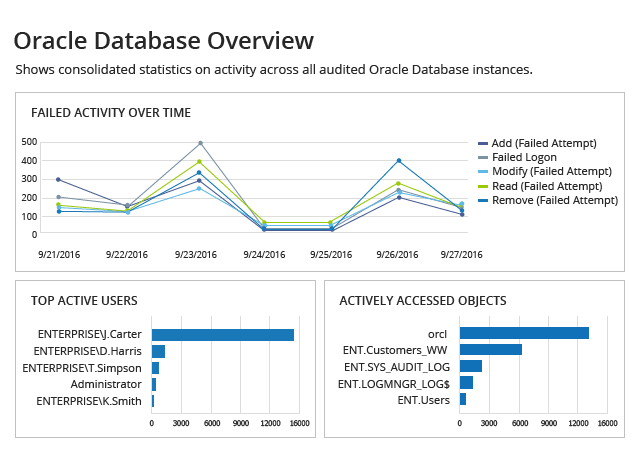 Netwrix Auditor for Oracle Database helps you properly monitor Oracle Database by delivering maximum visibility into what’s happening in your Oracle Database environment. It goes far beyond what performance monitoring tools can show you, so you can identify, track down and choke off threats before they result in data loss, privilege abuse or database unavailability. Harden data security by staying on top of changes made to database objects, as well as successful and failed attempts to access your databases. Ensure effective privilege management by gaining the visibility into changes to roles and permissions required to prevent privilege escalation and abuse. Streamline reporting processes and be always informed about changes and access events by simply subscribing to the reports you need; you’ll get them automatically on the schedule you specify. Identify the root cause of any suspicious action across your Oracle Database faster with the Google-like interactive search. Minimize the risk of data loss and privilege escalation by spotting and remediating insider and outsider threats with alerts on the actions you deem most critical. Keep your Oracle Database change and access log safe and sound in a two-tiered (file-based + SQL Server database) storage for years for future in-house investigations or audit checks.